Product prices and availability are accurate as of 2019-04-09 02:33:08 EDT and are subject to change. Any price and availability information displayed on http://www.amazon.com/ at the time of purchase will apply to the purchase of this product. 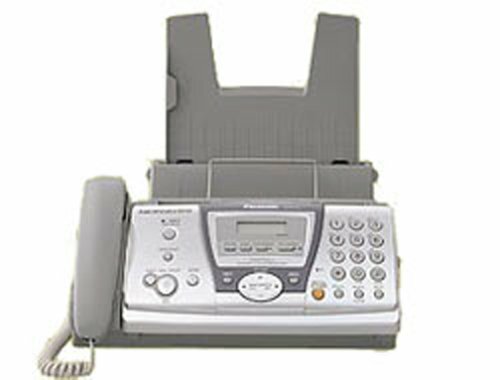 The KX-FP145 from Panasonic is a monochrome, slim-cabinet fax machine with a built-in corded phone, an all-digital answering machine, and caller ID/call waiting compatibility. With it's thin 7.5-inch height, this model makes an unassuming addition to your office. A 100-number phone directory helps you keep track of all your important numbers, while a built-in speakerphone allows you to communicate hands-free. The KX-FP145 has a 9,600 kbps modem speed and takes an average of 15 seconds to transmit a page. You can make copies at speeds of 2 cpm, while a multi-copy function allows you to make up to 99 copies from a single original. The 10-page automatic document feeder provides an easy way to transmit multi-page faxes, and an out-of-paper reception of up to 24 pages helps ensure that you never miss an important fax. A broadcasting feature lets you send a fax to up to 20 separate locations, and a voice pager call setting alerts you to any new voicemail messages. The answering machine stores a total of 18 minutes of messages, split between two mailboxes. A time/date stamp lets you know when each call was received. The LCD screen on the base helps you to navigate the machine's many features, while distinctive ring detection lets you assign various ringers to different phone directory entries, providing an auditory indication of the caller's identity. The KX-FP145 also comes backed by a six-month exchange warranty.